Welcome to 4.0, a community of gutsy people focused on a very big problem — school isn’t great yet for every child. But we’ve made a tiny dent. In the last six years, more than 750 4.0ers have learned how to test promising learning spaces and schools that work better for more kids. More than 100 4.0ers have taken what they’ve learned in those tests and built breakthrough solutions that now serve more than a million students. It’s so good to have each of you here for my favorite two days of the year. This session is about the current state of 4.0 and where we’re headed. I thought we’d kick it off with a trip down memory lane — not for nostalgia’s sake but for getting-better’s sake. After that, we’ll come back to the future of 4.0, and school itself. Let’s use mad libs, because…mad libs. What’s a mad lib, you say? It’s a fill-in-the blank tool we use at Essentials: ___ has a problem — ___; we solve this by ___. I’ve filled out one of these for each stage of 4.0’s development, pairing each with lessons I’ve learned about two relationships critical to our work: our relationship with the 20-year version of each of you, and our relationship with local communities. Here’s a high-level on those before we dig in. Our relationship with the 20-year version of each of you: We’ve been up and down the value-chain of innovation — from hunch, to first test, to more tests, to launch, to scale — looking for the best placement of 4.0 resources for you. Moving forward we’re going to center our work on helping you and others validate and test new solutions within the Essentials/Tiny Fellowship sequence. We’re doubling down on delivering support to people without making them quit their jobs. This means we can serve (and become) a radically more diverse group of people with much bolder ideas. Our relationship with local communities: We’ve struggled to find the right balance between supporting you as individuals and investing in the communities where you live. We’ve tried a bunch of things: establishing a second hub in New York, taking over Startup Weekend EDU, and helping launch local 4.0 affiliates in our Community Catalyst program. I now believe that 4.0’s small team should focus on founders and do less direct community support. We can kick the money we’ve been spending on staff efforts to you — to 4.0 Essentials and Tiny alumni already on the ground across the country. You’re aligned with our vision and can respond faster to each other than we can. Regardless of how many hubs we’ve got, you’ll always be smarter and faster collectively than any institution(s), including 4.0. One more thing, I’d also like to share what I’ve learned along the way; I’ve grown a ton and have a clearer sense of things I need to keep working on. Spoiler: My to-learn list keeps growing. Ok, let’s start with a mad-lib about our first two years: 2011–2013. Founders: We focused mostly on founders of schools here, not founders of other solutions. We were pretty downstream, focusing more on the 18–24 months before opening day. Since then, we’ve moved earlier, or further upstream in the process. Communities: We originally focused on the Southeast, trying to fill the often overlooked need for investment in this region. In fact, our first Launch cohort of six included three teams from Tennessee. This stage was home to one of my scariest moments as a CEO, calling our first funders to say we needed to change course; founders didn’t need what we had promised them/what we raised money to do. They wanted support earlier, and for more than just schools. I could talk for hours on relationships with funders here but long-story short — we gave up ~$6M when we made this tweak. Some funders came back, some didn’t. It was the right call. Scary, but right. Those changes, from schools to more than schools, and from the SE to the rest of the US, led us to another mad-lib, which we ran with for about two years, from 2013–2015. Founders: We did a lot. We expanded our user base, throwing our own events to recruit more than just school builders. We asked alumni to help, too; 4.0 birthday parties across the globe were a huge success. Partners like Idea Village in New Orleans and Startup Weekend EDU helped us get the the word out, too. We helped people validate problems in our Essentials workshops then helped them create companies to deliver those solutions, often encouraging them to quit their jobs to do our Launch program. Communities: We tested Essentials in three new markets in 2013: the Mississippi Delta, San Francisco, and NYC. NYC was the most responsive; we put boots on the ground quickly. Cambria, our communities lead, went up in Spring of ’14 to run a 12-week program called Prototyping Bootcamp. We hired Fu that winter. Alli started helping as a consultant in April 2015 and came on full-time in August. To meet growing national demand, we tried doing Launch once a year there. I signed a three-year lease for our new hub. Looking back, I wonder if we could have done Launch without our own space, bootstrapping for even longer than we had until then, because instead of supporting the local community, Alli was stuck managing our facility build out and operation. Elsewhere, Fu, our Chief Hustler, began building the first iteration of what would become Community Catalyst. Leaders from Austin, Birmingham, Charlottesville, and DC started doing local events and coaching back home with 4.0 help. We also took over Startup Weekend Education Education in the US (SWEDU). 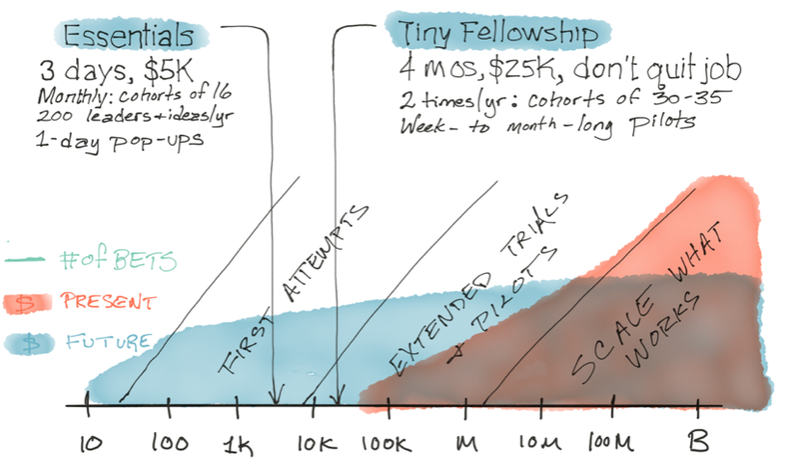 Looking back, we were spreading 4.0 too far across the many stages of new idea development, promising too much for founders while asking them to take monster risks. Of all the stages, the validation and testing work in the middle was where the greatest need was; there just weren’t any places to go to define problems and start to test solutions with real students and families before quitting your job. We started narrowing in on that while making a more concerted effort to find great partners to help upstream and downstream of our now narrower area of focus. We were soon on to another mad-lib, one focused on validating and testing, and on helping people without making them quit their day job. Before I get to the 2016 mad-lib, I want to share another observation I came to, too slowly. We weren’t just over-promising/under-delivering for founders, we were doing that for people interested in building communities, too — SWEDU organizers and Community Catalysts. They were actually a second user we’d committed to serve and it was our relationship with these members of the community I’d struggle to define in 2016. Founders: We made a firm commitment in the Tiny Fellowship to serve people before they quit their job, zeroing in on the validation and testing stages. We were able to run two iterations of this new format, adapting much of the Launch program to a larger cohort, in a more blended virtual and camp-based format. Communities: We’d started a second cohort of Community Catalysts in Denver, Los Angeles and Kansas City, but I didn’t do a good job predicting what we could deliver, what we’d ask, how we’d coordinate. Meanwhile, a year into managing SWEDU, we realized we’d have to start raising new money and wondered if TechStars, new owners of SWEDU, would keep it going on their own. After a year of unclear expectations for how to serve this second group of users, I had to admit we could only focus on user 1. So with as much humility and candor as we could, we: renegotiated a partnership with TechStars for them to run SWEDU while still sending teams with promising ideas to our Essentials program; explored lighter footprints in NYC; and decided to phase out the Community Catalyst program. We’ll still support our first two Community Catalyst cohorts, but we’ll focus on giving founders in their communities access to Essentials and Tiny when their own programming isn’t available. Fu. (David Fu’s been a rock at 4.0 for 3 years as Chief National Hustler.) You’ve selflessly given to founders and communities all over the US. You’ve taught me a ton; I can’t wait to see your next 17 years, especially in Johannesburg. Thanks. SWEDU organizers and Community Catalyst partners. To a person, you’ve been more gracious and patient with 4.0 through many iterations. Thank you. I think our new path will let us work more transparently and be better partners for each of you. Timely support for each founder when they’re testing solutions with students and families in their local community. I’d like to share my favorite food metaphor for the most intensive section of the path, stages 4–7. In the old days, chefs had to raise hundreds of thousands of dollars to build a better restaurant — risky, little actual diner involvement, limited to those with access and cash. These days, a chef can test incrementally with real humans long before they raise money or quit their job for a few hundred bucks. This chef might buy a friend (who’s got the keys to the restaurant where they work) a six pack of their favorite IPA and use their kitchen on a Sunday night when the restaurant is closed. This low-stakes, very real world world test of a new restaurant concept is far more effective than sharing recipes with friends. Within a supportive community of people who can lend you resources to run that test and people who will eat your food, this can be done quickly, cheaply, and with much less risk than starting a whole restaurant. And best of all, it’ll let you see what actual humans think about your new food. While Essentials (Stages 4, 5) focuses on planning and running pop-up dinner scale tests, The Tiny Fellowship (Stages 6 and 7) represents the food-truck stage of development. 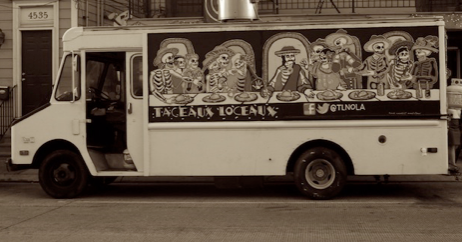 If an aspiring chef gets some good feedback, she might level up to a food truck. 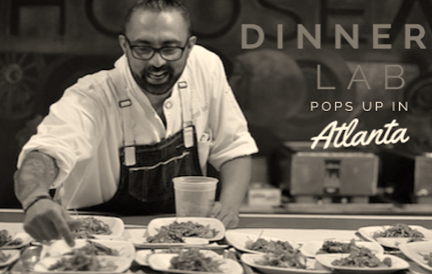 Where a pop-up meals costs hundreds, a food truck costs thousands but provides much more feedback and better mimics what a future restaurant might look like. It might even convince the chef they don’t need a restaurant at all! That’s what we try to coach during the Tiny Fellowship. With a $10K wallet and lots of coaching, we equip you, founders of new spaces and tools, to run extended week- to month-long pilots with 10 or more students in your local community. Education is still stuck in a pre-popup, pre-food-truck world. We’re trying to change that. Education is still a pre-popup, pre-food-truck world. Financial and political capital is stacked too far downstream waiting to “scale what works.” We assume the next generation will get to this mountain on their own — that they can come up with breakthroughs sans-support, sans-$ and sans-feedback. Disclaimer: $5k and $25k amounts reflect the value of the investment 4.0 Schools makes into each participant. We can blame the system for its capacity to resist change, but I think our approach to changing the system needs work. We need to move upstream to meet the people trying to make the future better where they are right now instead of waiting for them to work miracles without capital and support. We think we can make the future of school better with investments like these — smaller, faster, earlier. For too long, we’ve kept capital away from you, the next generation of leadership, until you can prove yourselves worthy of spending million dollar checks to scale things. This approach gives us an opportunity to move capital further upstream in ways that minimize risk for investors and maximize opportunities for you to build a far better future of school. Communities: Instead of running a separate business line to establish local institutions to support founders, we’re going to hire individuals — alumni of Essentials and Tiny. You, if you’re interested, will provide targeted, timely, local support to founders when they’re in one or more of these 8 stages. 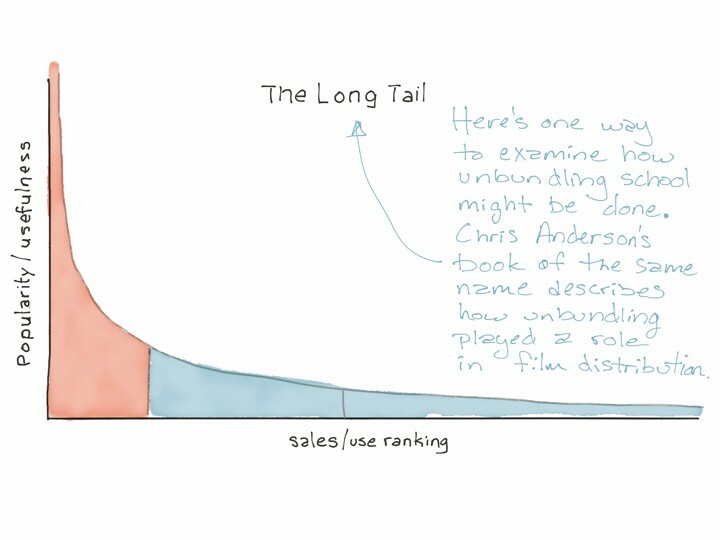 This lets us be more responsive to many more founders in many more places. And it lets us react year-round instead of once or twice a year through SWEDU. It also gets cash to alumni when you really might need it — in your early days. Finally, it leverages the best coaches of all — you; you’re the best people to help others on this path because you’re just a couple of steps ahead. This simpler approach emphasizes founders helping founders, letting our community explore something critical to the future of school itself, student-to-student teaching. NYC: After three years as our second hub, we’re planning to transition out of NYC by the end of June this year. After that, we’ll do our coaching for NYC-based Essentials alums and Tiny participants primarily through alumni contractors. That means all 4.0 Schools staff will now be located in New Orleans. Our NYC Community Manager, Alli (Dunn) Lee, who has been working for the NYC Education community for nearly nine years, will be staying in New York City to pursue other efforts in the education community in the City, and will be moving on from 4.0 Schools by the end of June. Alli: You’ve dealt with the constant adjustments to NYC and its role in our national strategy with candor and hospitality, providing leadership, coaching and profound hospitality to me, the 4.0 team and the NYC community. Thank you for being part of this family; your vision for a more humanizing and equitable system of schools for more than a million kids in NYC is sharp and right, and I’m fired up about what you’ll do in the next 18 years. You might note that we’ve left out the word “schools.” That’s not because I don’t believe in schools. It is because we need to push ourselves to rethink school. For aspiring school founders in the group, I dare you to first build non-school-of-record learning spaces for kids before pursuing full-day school models. You can be more innovative, and you’ll have more reps with students and families if you hold off on the recipe-sharing and just start cooking for students and families. You. 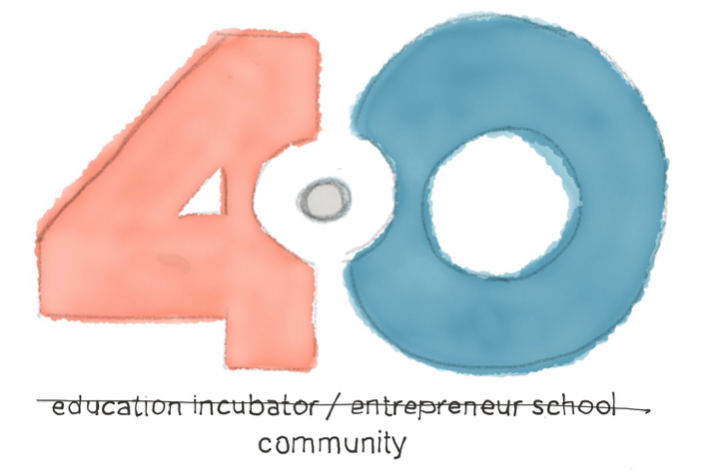 4.0 is not an incubator. Nor is it an accelerator. Nor is it a school for entrepreneurs. It is a community. Scratch that. We. Are. A community. I’m learning from you faster in this community of humans than I ever could if 4.0 was just an institution. I am grateful and humbled to be part of this with you. Thanks for your courage, candor, and commitment to our children. Let’s keep learning, together. During 4.0’s 2nd Community Summit in February of 2017, I shared some thoughts on the future of school. Here are the images I shared, with some commentary thrown in on a few. I use another fill-in-the-blank mad-lib: the future of school is _____. The future of school is for all of us, not for a few. Since we passed our first law about school in 1642, which contemplated school for wealthy white children but not enslaved children, we’ve written a history of schooling that’s the few vs. the rest. During Community Summit, I couldn’t find a better way to express what I feel about this than what Langston Hughes wrote in 1936 about the past and the future of America. So we read his poem as a group, out loud, 1 paragraph per person. We really owned it. It was a powerful experience for many of us. Beaten yet today — O, Pioneers! 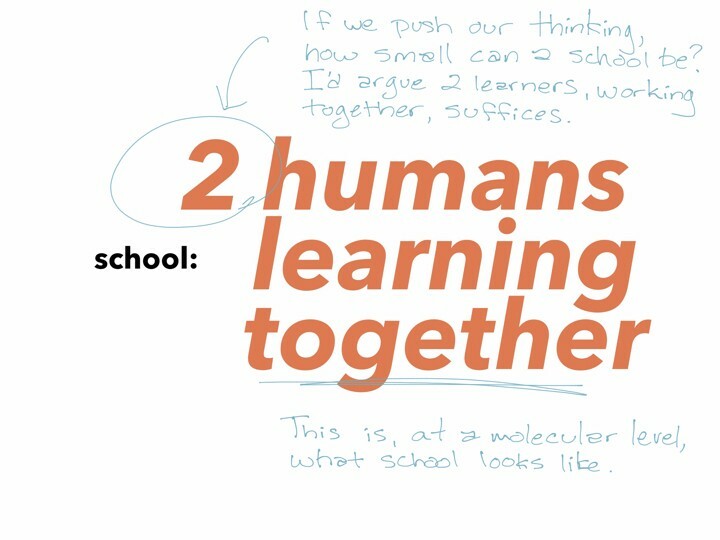 The future of school is human, not institutional. 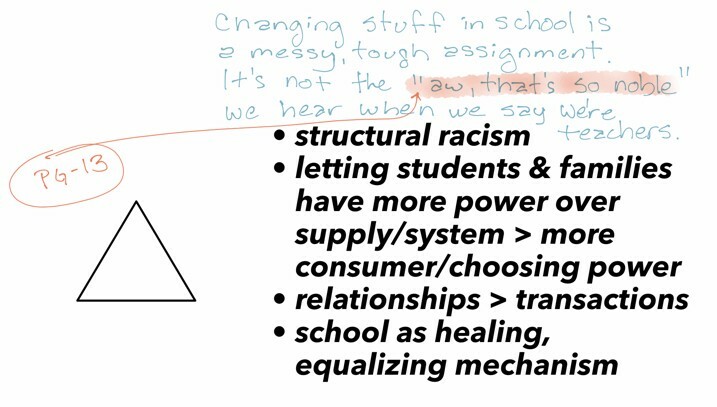 I discuss one current dictionary definition of school and how unhelpful and outdated it feels and then propose an alternative definition that we’ll be using moving forward within the 4.0 community. 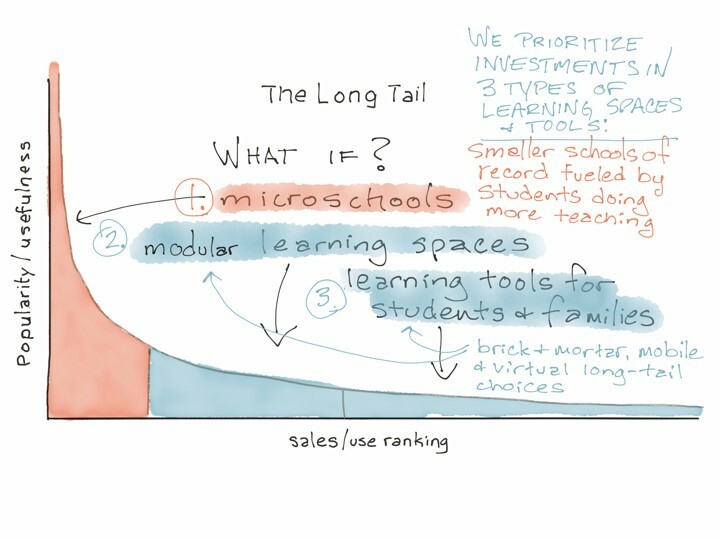 The future of school is smaller scale. 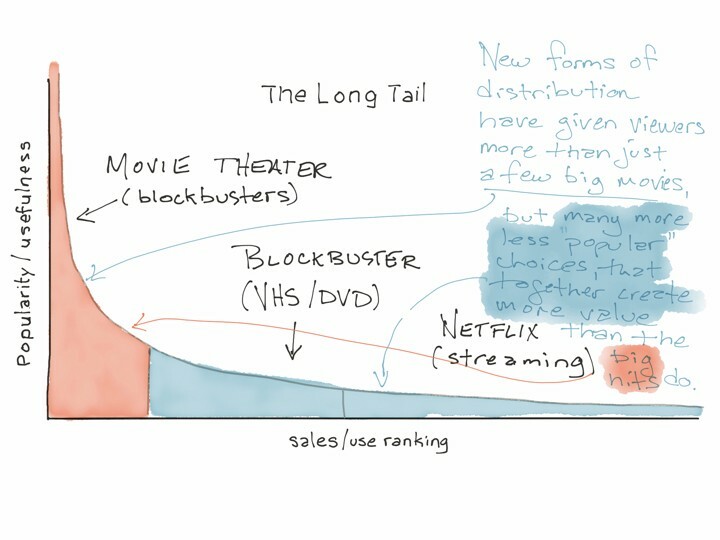 The concept of industrial scale dominates how we think about and do school. I don’t buy it; I want school to be human scale. I argue for smaller learning spaces of close to 150 students or less where we can invest in students teaching each other. The future of school is unbundled. I argue for disciplined responsible investment in diverse ecosystems of learning spaces and tools that provide far more variety and opportunities than a monolithic one-size-fits-all industrial solution. The future of school is rated R.
I argue that changing stuff in a highly institutionalized world isn’t the “aw that’s sweet” kind of story we usually associate with people who choose to become educators; it’s actually a very messy, conflict-laden exercise. Then I drop a verse in from my favorite songwriter, Bill Mallonee. The future of school sounds like bubbles popping. I share a powerful insight from Hassan, who hopes the future of school can break through the barriers we put up between ourselves and others, and the barriers between ourselves and knowledge we’ve yet to attain. I suggest a bubble popping as a better illustration than a lightbulb turning on for the moment when learning happens. Then, I show a really cool slow-mo video of a bubble popping from the The Slow Mo Guys. 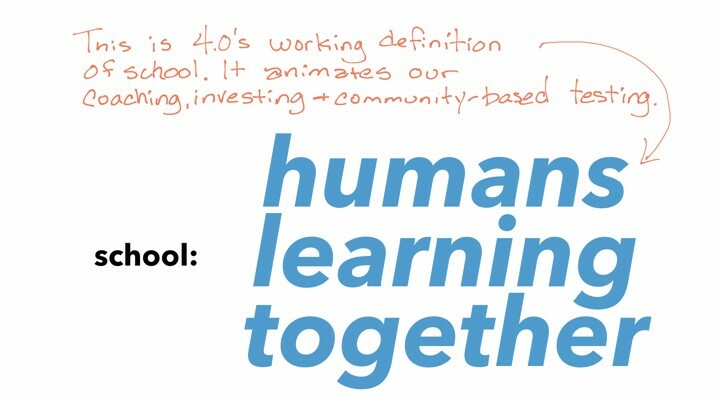 As we move forward, we’re hoping the learning spaces and tools people in our community create for the human students and families they know reveal glimpses of this brighter, better future of school — a future with less bubbles. That’s what we’ll be working towards over here at 4.0. If you’re able/interested, you should absolutely join us. 4.0 is not-for-profit and the people who work here are dedicated to connecting, coaching and investing in people to test new learning spaces and tools with students and families in their local communities. We’re at 4pt0.org, on medium: 4.0 Schools, fb: /4.0Schools, and twitter: 4pt0schools. Matt’s at @mcandler on twitter and medium. Thanks again for your time. If you want to go even deeper, here’s a video of our full future of school session from Community Summit!